Not true. The VCOG with Palm Device award consists of four variations: 1) the full-size medal. 2) a miniature version of the full-size medal. 3) the unit (gold-color framed) ribbon (or "colorbar"). And 4) the individual frameless ribbon (colorbar). 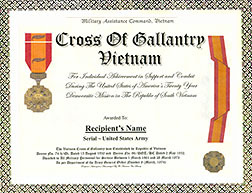 All four variations are authorized to ALL military persons of any Nation who served under Military Assistance Command, Vietnam. Additional Note for American recipients: The United States in the only nation that does not produce a full-size medal associated with its (ribbon-only) unit awards. This fact confuses some American Vietnam vets who mistakenly believe or advocate that Americans can only wear/possess/display the VCOG unit ribbon. However, rather than continue to mistakenly believe or erroneously advocate that the VCOG is restricted to the framed unit ribbon, American veterans should lobby their Congress to create/institute full-size medals associated with American unit awards so that the United States military medal array catches up to the rest of the world. Civilians who served in CIA, DOD and the State Department are also authorized the VCOG under the 1974 Vietnamese edict recorded by MACV General Order (GO) #8. Not true. The VCOG was authorized to non-military personnel only on an individual basis resulting from their individual actions when performing a military type function or activity. The bronze and silver star devices on the VCOG are authorized to recipients of the Bronze Star Medal and the Silver Star Medal. Not true. The four VCOG medal devices are: Palm Leaf, Bronze Star, Silver Star and Gold Star. When awarded/authorized on an individual basis the Gold device applies to individuals assigned to a Corps Level unit. The Bronze Star device applies to an individual assigned to a Brigade or Regiment Level unit. The Silver Star device applies to an individual assigned to a Division Level unit. And the Palm Device applies to individuals assigned to an Army Level or higher unit. The VCOG is the equivalent to the French Croix de Guerre. The government is required to issue the VCOG to authorized recipients or a single member of their family if the authorized recipient is deceased. The new government in Hanoi is issuing the VCOG to military personnel Allied to the former Government of South Vietnam. Not true and quite the contrary. The 'Hanoi' government is not issuing South Vietnamese medals. In fact, the Hanoi government has formally requested that all South Vietnamese medals, as well as the South Vietnamese flag, be officially banned around the world. Australians never served under MACV so Australian Vietnam vets are not authorized the VCOG as mandated by the Vietnamese Congress in 1974. Not true. Australians sometimes confuse USARV with MACV. Australians did not serve under USARV (United States Army, Vietnam) which was created by the United States to govern US Army personnel which many Australian units operated alongside. But Australia, and ALL nations with military units operating in Vietnam, were subordinate to MACV (Military Assistance Command, Vietnam) which was created by the United Nations. MACV was the highest level military government in Vietnam. It was under MACV and not USARV that the Vietnamese Congress issued its VCOG (and other medals) awarding authorization. If the VCOG is not on your DD-214 you cannot own/wear/display the medal. And you should request a DD-215 listing the VCOG if it is not on your DD-214. Not true. Like the National Defense Medal, the Appreciation of Service Certificate and the Cold War Medal, the VCOG is an 'automatic' award that is fully authorized to ALL veterans who served in Vietnam. If the VCOG is not listed on your DD-214 (because you discharged prior to 1974 or the clerk who typed your DD-214 after 1974 was an airhead) it is not necessary to request a DD-215 as long as your DD-214 displays Vietnam Service. You are 'automatically' fully authorized. The VCOG awarded to an individual on a personal basis prior to the 1974 Vietnamese edict has higher standing than the VCOG authorized in 1974 that was authorized to everyone who served in Vietnam. Not true. The Vietnamese Congress made no such distinction between individual or collective award. All VCOG authorizations are equal. Some elements of the 1974 VCOG authorization were changed by either former President Nguyen van Thieu in France or Vice President Ngo Cao Ky in California where they lived in self-imposed exile after the war. Not true. The official Government of South Vietnam ceased to exist in May, 1975. The former president and vice president of Vietnam voluntarily relinquished their official authority to enact/declare/institute any post-government mandates, and neither expressed any desire to do so. Both gentlemen have repeatedly stated that all actions mandated by their former government are "written in stone, for all time. " A group headquartered in Orange County, California that now proclaims itself to be the official representative of the former Government of South Vietnam has issued a proclamation that the VCOG with Palm Leaf Device has been "upgraded" to the Silver Star Device. Only partly true. This 'group' is composed of self-appointed, disgruntled, self-exiled nuts who are represented by an American Vietnam Veteran who imagines himself to be a reincarnated version of General Douglas MacArthur. This delusional American veteran and his 'group' of Vietnamese exiles have no official standing. They are not recognized by the U. S. State Department. They have no official authority whatsoever, and no authority to modify any act, decision or edict established by the legitimate Government of Vietnam, now deceased (as of 1975). The VCOG with Palm Leaf device remains the officially authorized award to military personnel of all Nations who served in Vietnam between 1954 and 1975. There has been and will be no "upgrade" of the Palm Leaf device to any other device. Each of the four devices are equal. Commemoratives of the VCOG that are sold by medal retailers can be worn on the US military uniform by Honor Gaurd and other veterans. Not true. There is only one official VCOG. There are no official "commemoratives" of the VCOG. These VCOG commemoratives legally being sold by commercial medal retailers and made to look similar but not identical to the official VCOG (identical ribbon coloring, etc) are nothing more than "Cracker Jack" box toys intended for purchase by Vietnam War wannabes who can now be punished by law (The Stolen Valor Act of 2007) for illegally possessing or claiming recipientship of the official VCOG. Vietnam vets who served in Vietnam can possess the official medal and have no need, and should have no desire, to possess a toy VCOG "commemorative". Additional Note to Veterans: All official Vietnamese awards may be worn on the discharged veterans uniform for Honor Guard of other purposes. Active Duty (AD) personnel who served in Vietnam are restricted to wearing only those Vietnamese awards specifically authorized by the Dept of Defense for wear on the AD uniform. To find out which Vietnamese medals may be worn on the ACTIVE DUTY uniform, CLICK HERE. Again, the Vietnamese awards listed on the above referenced link MAY BE WORN by Honor Guard and military holiday/celebration personnel. (See the official Order of Military Precedence for proper wear/display/alignment order. The military and/or the VA is required to issue a certificate for the VCOG. The government maintains a list of all VCOG recipients. True. These lists are either maintained by agencies directly responsible for providing certain, related services or provided to various veteran information agencies such as The War Library for general research. With regard to the VCOG list, a listing of all Vietnam Service personnel (who are also authorized the VCOG, as well as other Vietnamese awards) is online. CLICK HERE for database access information. The VCOG can be authorized with a "V" for Valor. Not true. Like the U. S. Silver Star medal that, in itself, defines personal Gallantry, Heroism and Valor, the VCOG award does not have a "V" device because the medal itself represents personal Valor. If I find a VCOG medal that medal now belongs to me. The United States Secretary of Defense will assign the lost VCOG to the proper government authority (of the recipient's Nation) for proper delivery to the authorized next of kin. If I find a VCOG medal it's okay for me to look for the owner. Not true. Found items should be mailed with a report to the address above. If I buy a VCOG medal that once belonged to a veteran I can ask the veteran or his family to compensate me for the money I spent when I return the medal to them. No, it would be improper to do so. Military medals hold an exalted place in all Allied nation societies. The military recipient of that medal gave part of him or herself. A good citizen should feel patriotic in restoring a lost item to a recipient. Whenever you see a pre-owned military medal being sold you should ask the seller to please return the medal to the Secretary of Defense at the address listed above. Additional topics will be added as they are received. The above dates in the DAGO apply only to the wear of Vietnamese medals on the ACTIVE DUTY military uniform. The dates do not apply, under Vietnamese regulation, to all Allied military personnel who were authorized the Vietnam Service Medal prior to 1965 and after 1973. Individual recipient nations may restrict wear of foreign medals on their Active Duty uniforms.